Benurio has not had a particularly good time recently, but that is not to say that he hasn't lived life previously. In fact his story could be deemed a 'rags to riches'one, because although he was born the son of a modest merchant, he became the most admired of all the officers in the Roman Legions. But (it's time to get those hankies out!) Benurio had one minor flaw, his love for the pretty maiden Calia (get those sick bags out!). Nerio was another who loved sweet Calia, but alas his heart was to be filled with spite and jealousy because of Benurio, and using his position as chief of the Emperor's Praetorian Guard, he discredited the young officer and plunged him into the world of chariot racing. Chariot racing is what Colosseum is all about, and mad, manic chariot racing at that. As Benurio you take the reigns of one of many chariots that line up for the race of their lives (deaths, would be more appropriate!) and your main objective is to last four races in order to enter the Emperor's favour once more. Each race consists of four laps of a rather dangerous course, and there are many hazards that await to eliminate you. Other racers also have the same ambition as you, to survive, and they can also prove more than a handful. The opponent's will always attack you when they can and this is another factor that makes the game a mite difficult. They all carry different sorts or weaponry and whilst you are flying headlong around the course, avoiding obstacles, you must slug it out chopping and slicing them in order to obliterate the threat. 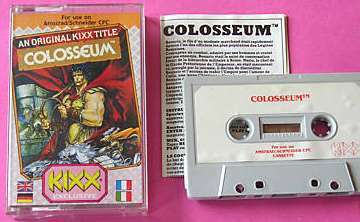 Colosseum uses some rather inventive ideas (in this market of many) and tries it's very hardest to bring those ideas across. Unfortunately it just doesn't make the grade. For a start it is just far too difficult, as you do not actually see an obstacle coming, but die almost immediately. The graphics are very shaky to say the least, and although they are very colourful and nice on the eyes, they move like a lego model on something illegal. The scrolling is another factor that would deter anybody from playing often. One saving grace is the way that you scroll around corners, this is something I've not seen in a game before, but you can bet we'll see it again. What is most sad though is that software companies still think they can take a half-baked piece of offal that they know wouldn't sell as a full price game, and sell it at a price that many kids would go for. I'm not happy!